For the Burgundian and Habsburg tribunal in the County of Flanders, see Council of Flanders. For the pro-German council during World War I, see Raad van Vlaanderen. The Flemish Parliament (Dutch: Vlaams Parlement (help·info), and formerly called Flemish Council or Vlaamse Raad) constitutes the legislative power in Flanders, for matters which fall within the competence of Flanders, both as a geographic region and a cultural community of Belgium (unlike the French-speaking community and Wallonia, which each have separate legislatures - the Parliament of the French Community and the Walloon Parliament). The Flemish Parliament approves decrees, which are Flemish laws, applicable to all persons in the Flemish Region, and to Flemish institutions in Brussels; it appoints and supervises the Flemish Government; and it approves the Flemish budget. 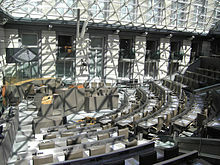 The Flemish Parliament meets in the Flemish Parliament building in central Brussels, and its members and staff are housed in the House of the Flemish Representatives. From 1830 until 1970 Belgium was a unitary state with a single government and a bicameral national parliament. The laws issued by Parliament applied to all Belgians, and government ministers exercised their authority across the length and breadth of the country. Between 1970 and 2001 the Belgian Parliament approved five successive constitutional reforms. Slowly they changed Belgium from a unitary into a federal state. Part of this was to give the communities and later the regions, their own parliaments. On December 7, 1971, the Cultural Council for the Dutch-speaking Cultural Community held its first meeting, later followed a parliament for the Flemish Region. Flanders decided as early as 1980 to merge the Flemish Community with the Flemish Region. As a result, Flanders now has a single parliament and a single government with competence over community as well as over regional matters. This Parliament was called the Vlaamse Raad until it was officially renamed Vlaams Parlement (Flemish Parliament) on June 13, 1995. Over the last thirty years, Flanders has thus developed into a separate state within the federalised Belgium. Members are called "Vlaamse Volksvertegenwoordigers". In English, they are referred to as "Members of the Flemish Parliament" (MFPs), like the MSPs in Scotland and the MEPs in the European Union. The title "Flemish Representative" is also used in English. Since 1995 members of the Flemish Parliament have been directly elected. Currently, many voices in the Flemish Movement would like the Flemish Parliament to acquire certain sovereign powers in addition to those concerning language, culture and education. Furthermore, among the broader Flemish population a consensus has emerged that the Flemish Parliament should also acquire much larger financial and fiscal autonomy. The Flemish Parliament enacts decrees, which are Flemish laws, either as a decree of the Flemish Community or as a decree of the Flemish Region (or often as a decree combining provisions for both entities). Regional legislation is only applicable to all persons in the Flemish Region whereas community legislation also applies to Flemish institutions or services in Brussels (and thus to persons in Brussels who choose to make use of these institutions or services, such as schools). Culture: The Flemish parliament is competent for all cultural matters. This includes protection of the cultural heritage (e.g. literature, fine arts), tourism and the media. The public Flemish radio and television broadcasting company is the VRT. Language use: including language use in schools and universities, in the Flemish and local administrations, and in relations between employers and employees in the Dutch-speaking part of Belgium, with exception of the 'language facilities' enjoyed in some municipalities. All ‘matters relating to the person’: youth protection, family policy and childcare, together with policy regarding the handicapped, old age pensioners, equal opportunities and the integration of migrants. Education: from kindergarten to university including scholarships, though the establishment of the period of compulsory education, requirements for awarding degrees, and pension schemes for teachers remain at the federal level. Health care: including preventive health care, home care, institutions for mental health care, but excluding health insurance, financing of hospitals and most other competencies that remained federal. Scientific research: this field is the full responsibility of the regional authorities, except for aerospace and military research (that remained federal). Public works and transport: includes roads, ports (the Port of Antwerp, Port of Bruges-Zeebrugge, Port of Ghent and the Port of Ostend), the regional airports (including Antwerp International Airport and Ostend-Bruges International Airport), and urban and regional transport. Agriculture: includes the Agricultural Investment Fund, the agricultural education, the development of rural regions, the sale of agricultural and horticultural products and the fisheries policy. By the stipulations of the Lambermont Agreement (2001), the regions are competent for almost the complete agricultural policy but a few security aspects like food security and animal welfare which remained under the competence of the federal government. Local government: includes the allocating of financial resources to the 300 Flemish municipalities and to the five Flemish provinces, and administrative supervision of these communes and provinces and their laws. For all areas within its sphere of competence (both vis-à-vis community or regional competences), the Flemish region can conclude international treaties with other states, whether they are national states or member states of a federation. This competence includes development cooperation and foreign trade. A regular legislative session starts in September, when the Government presents its "September Declaration" (Septemberverklaring), a kind of State of the Union. Plenary sessions are usually held on Wednesdays. The Flemish Parliament largely functions like its federal, community and regional counterparts, mutatis mutandis. Bills are usually introduced by the Government (ontwerp van decreet), but members of parliament can also propose bills (voorstel van decreet or private member's bill). Bills are first considered in committee, after which they are put to a vote in the plenary. Votes are usually recorded electronically. For example during the 2009–14 legislature, 407 government bills were adopted, while only 102 private member's bills were made law. 118 members are directly elected in the Flemish Region. They have voting rights for both regional and community competencies. 6 members are directly elected in the Brussels-Capital Region by those voters who voted for a Dutch-speaking party in the Brussels regional elections. They have no voting rights for the regional competencies. The elections take place every five years, simultaneously with the elections for the other regional and community parliaments and for the European Parliament. Thus, de facto the European decision-makers determine when the Flemish Parliament elections occur. The following table lists each legislative term since 1995, when the Flemish Parliament was first directly elected following the fourth state reform. The parties are ordered by size in the respective term. Green coloured parties indicate the government majority, whereas red parties form the opposition. At the beginning of each parliamentary year, on the fourth Monday in September, the Flemish Parliament elects its Speaker. The Speaker chairs the plenary sessions of the Flemish Parliament and acts as its official representative. He or she determines whether a certain initiative is admissible and thus can be put to parliament at all. The Flemish Ministers take the oath before the Speaker of the Flemish Parliament. Only the head of the Flemish government, the Flemish Minister-President, takes the oath before the King. The current Speaker of the Flemish Parliament is Jan Peumans of the New Flemish Alliance (N-VA). The Speaker of the Flemish Parliament is assisted by the Bureau, which consists of the Speaker, four Deputy Speakers and three Secretaries. The Bureau is responsible for the day-to-day activities of the Flemish Parliament and meets at least once every two weeks. The Extended Bureau, which consists of the Bureau and the floor leaders of the recognised political fractions in the Flemish Parliament coordinates the political activities of the Flemish Parliament and sets the agenda for the plenary session. It usually meets every week on Monday. Much of the work of the Flemish Parliament is done in committee. The Flemish Parliament currently has eleven standing committees. Each committee is specialised in a particular subject area and consists of 15 Members of the Flemish Parliament. The primary task of the committees is to examine the texts of decree proposals and organise hearings and discussions on decree proposals. There are usually also ad hoc committees, such as the Digital Flanders Committee and the Flemish Constitution Committee. Wikimedia Commons has media related to Flemish Parliament.